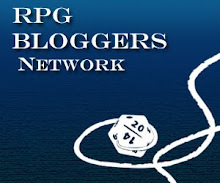 The 8th session of our Northern Reaches campaign (with pictures) is now up for your enjoyment. This is the session from our day-long "Funion Fest" as my friend Darren called it - well said. In this session the party began a new adventure - to the Caves of Chaos! Happy New Year to everyone. Be sure to raise a glass and think of Scottish poet Robert Burns when you sing "Auld Lang Syne" tonight. I'd like to develop a better method of identifying magic items for my players. Assuming a player doesn't want to test a thing (sword, potion, wand, etc) out in combat, I normally charge them a hefty 100gp or the services of a magic-user or cleric. I'd like to give players at least some opportunity to occasionally figure things out on their own. What do you do in your games? Alternatively, have you come across a good method elsewhere? I painted a few more citadel miniatures prior to Christmas. 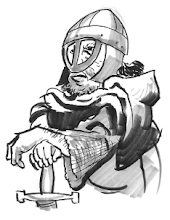 I love the Bretonnian peasants, they're perfect for poorly equipped villagers (or whomever), down on their luck, who turned to working as men-at-arms as a last resort. Alongside these I have a Bretonnian knight I bought in about 1986-1988ish that I just repainted. He turned out a little quirky, but that's ok. Sometimes I have a vision for a particular mini and sometimes I don't. I really like the pose of the last mini, a Norman inspired knight in a creeping-along-the-dungeon position. Seems there's no love for the d12 in the early editions of D&D. This is one of the few things I lament about old school play. I really prefer a game that uses all the polyhedrons, simply for variety sake. 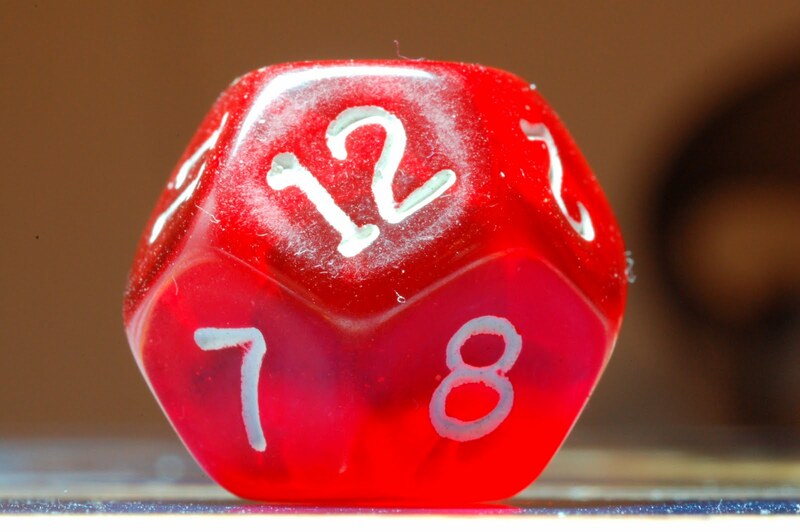 I really do get bored of rolling d6s. So, I'm toying with the idea of raising the damage of either the Halberd or the Two-handed sword from 1d10 to d12. If it was AD&D the variable damage vs L sized creatures would remove the need, but because were playing a B/X-AD&D hybrid I'm stuck. Does anyone have any constructive suggestions to incorporate the d12? 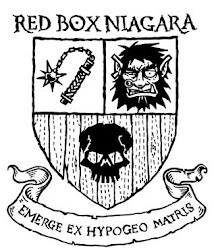 First, session number 7 of our Northern Reaches campaign took place on Friday and the report is available at Red Box Niagara. This was the final short-ish session of the Tomb of the Iron God adventure. Switching gears, I haven't done much painting in the last two months largely because I've been sick with a lung flu/cold that reappears every other week (or so it seems). Also the fall term really picks up speed at my university and there's just no extra time. I did manage to paint a couple PCs recently. This is a mixed bag of both Ral Partha (bought from Ironwind Metals, they are great guys), Citadel, and one Red Box Miniature. Not sure if I will get to post before Christmas so I want to wish everyone a very Merry Christmas. We have our Northern Reaches Mega Session (looks like B1 is the leader in the clubhouse) before the New Year and I'll post that undoubtedly longish session summary not long thereafter. All the best. Citadel: I really love this miniature. He looks like he should be on the cover of a module painted by Pete Mullen or Erol Otus. I'm planning a full-day classic D&D session between Christmas and New Year's Eve! Woot! I'm pretty excited about it! I haven't played a day session like this in a long time. This is a busy time of year so I want to get a head start preparing the adventure, etc. We look to have a good group of players. If you've read the rumours section of the Red Box Niagara site, I've dropped hints for both B1 In Search of the Unknown and B2 The Keep on the Borderlands. I know it's a tough call, but please vote and let your voice be heard. I have a particular leaning, but no decisions have been made. I want your input. Also, have you ran a full day session recently? How did it go and what suggestions do you have to make it a fun day? I think these two figures are grenadier. Can anyone confirm or set me straight? Northern Reaches: Session 6 with Video! We just played our 6th session of the Northern Reaches campaign. We experimented with some video. Our latest session report from the Tomb of the Iron God is up, check it out. OK, thanks to the commentors I've revised my list of monsters for an adventure I'm going to work on in the coming weeks. I'd like to create an introductory adventure (you can never really have enough of those), but this list looks more like a level 2-4ish senario. Again, I want the themes of rot and corruption to come out in the monsters.